On this date in 1941, a quiet Sunday morning on the Hawaiian is­land of Oahu just before 8 o’clock, Japan staged an un­pro­voked attack on America’s door­step, the U.S. naval base at Pearl Harbor and its defending Army Air Corps and Marine air­fields dotting the harbor peri­meter. Twelve days earlier, on Novem­ber 26, over 30 vessels of the Japa­nese First Air Fleet, among them six air­craft carriers with over 420 embarked planes, left Japa­nese waters on a 3,400‑mile jour­ney for a point 250 miles north of the Hawaiian Islands. The most power­ful carrier task force yet assem­bled sailed into his­tory under the com­mand of 58‑year‑old Vice Adm. Chūichi Nagumo. On Decem­ber 1, Tokyo sent Nagumo the coded signal to bomb Pearl Harbor. By the after­noon of Decem­ber 7, 1941—the “Day of Infamy,” as President Franklin D. Roose­velt called the date—the heart of the Amer­i­can Pacific fleet lay burning or settled on the bottom of the har­bor, among them eight great battle­ships. (By sheer good for­tune, the fleet’s air­craft carriers, which soon would play a deci­sive role in turning the tide against Japan at the Battle of Midway the following June, were at sea.) Over 3,500 U.S. sail­ors, Marines, air­men, sol­diers, and civil­ians lay dead, many of them en­tombed for eter­nity in ships such as the USS Ari­zona and USS Utah; another 1,178 were wounded. 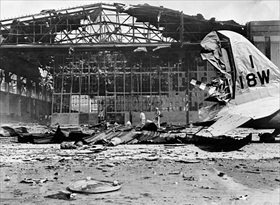 More than 340 Army and Navy aircraft were destroyed or damaged. On the Japa­nese side, losses were modest: 64 airmen killed, 5 ships sunk, and 29 planes destroyed. The sur­prise attack seven-and-a-half decades ago began a non­stop on­slaught of Japa­nese con­quests that brought down Ameri­can, British, French, and Dutch flags through­out South­east Asia and the Paci­fic. Yes, Pearl Har­bor was the most devas­ta­ting mili­tary assault in Amer­i­can his­tory and a stun­ning tacti­cal vic­tory for the Japa­nese mili­tarists. But Pearl Harbor also spelled Japan’s doom, just like Adolf Hitler’s and Benito Musso­lini’s decla­ra­tions of war against the U.S. four days later effec­tively spelled their coun­tries’ doom. The aroused U.S., with deep pock­ets of wealth, in­dus­trial power, and pro­spec­tive mili­tary strength, was now allied with tiny em­battled Great Britain against the am­bi­tious and autho­ri­tarian des­pots in Tokyo, Berlin, and Rome. Within three years, U.S. forces were knocking down the doors of Japan’s and Germany’s home fortresses to their nations’ grief. 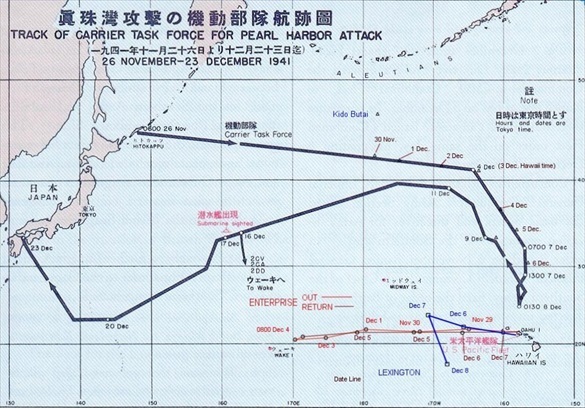 Above: Route of the Japanese Pearl Harbor Striking Force to and from Pearl Harbor (bold black). Routes of U.S. car­riers Enter­prise (red) and Lexing­ton (blue) in early Decem­ber are shown to the west of the Hawaiian Islands. After launching its air and sea attack on Pearl Harbor with over­whelming force, the Japa­nese carrier task force sailed away undetected and virtually unscathed. 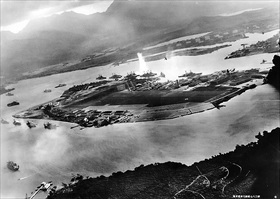 Left: Photograph from a Japanese plane of Pearl Harbor’s Battle­ship Row at the beginning of the attack. The explo­sion in the cen­ter is a torpedo strike on the USS Okla­homa. Two attacking Japa­nese planes can barely be seen—one over the USS Neosho, a fleet oiler, and one over the Naval Yard. 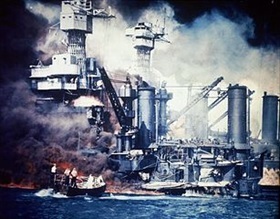 Of eight battleships in the harbor, the attack destroyed the USS Arizona, sank the USS Cali­fornia and the USS West Virginia at their moorings, and caused the USS Okla­homa to capsize. 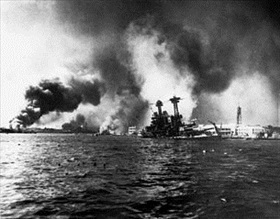 The USS Nevada was forced to beach and three were damaged but remained afloat. Addi­tionally, the attack severely damaged nine other war­ships, destroyed 188 air­craft, and killed 2,335 U.S. service­men and 68 civilians. The greatest loss of life occurred aboard the USS Arizona, which lost 1,177 sailors and Marines; just 335 men survived the attack. 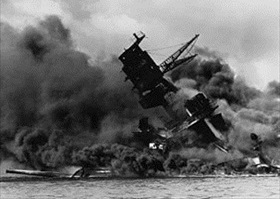 Right: Hit by an armor-piercing bomb, the forward maga­zines of the USS Arizona exploded, sending the battle­ship to the harbor bottom just 14 minutes after the Japa­nese attack began. The supporting struc­ture of the forward tripod mast col­lapsed after the maga­zine exploded. The ship burned for two days. 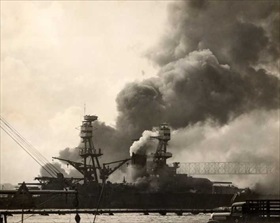 Today the sunken Arizona is a war memo­rial that com­memo­rates the “initial defeat and ultimate victory” of all lives lost on December 7, 1941. Left: The battleship USS California is seen slowly sinking along­side Ford Island, Pearl Harbor, as a result of bomb and torpedo damage that killed 100. The destroyer USS Shaw burns in the floating dry dock in the left dis­tance. The battle­ship USS Nevada is beached in the left-cen­ter dis­tance, having lost 60 men in the attack. The California returned to service in Janu­ary 1944, the Shaw in June 1942, and the Nevada in October 1942. Right: The battleship USS West Virginia took two aerial bombs, both duds, and seven tor­pedo hits, one of which may have come from a Japa­nese mid­get sub­marine. Sailors in a motor launch are pic­tured rescuing a sur­vivor from the water along­side the sunken ship during or shortly after the attack, which killed 106 men. The West Virginia returned to service in July 1944. The battle­ship USS Tennes­see, which lost five sea­men in the attack, is visible behind the West Virginia. The Tennessee returned to service February 1942. 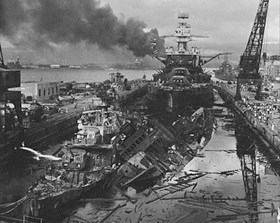 Left: Admiral Husband E. Kimmel’s flagship, the battleship USS Penn­syl­vania, can be seen in dry dock behind the wrecked destroyers USS Downes and USS Cassin at the Pearl Harbor Navy Yard soon after the end of the Japa­nese air attack. The Cassin capsized against the Downes. The torpedo-damaged crui­ser USS Helena can be seen in the right dis­tance beyond the crane. In the cen­ter dis­tance is the cap­sized Okla­homa with the USS Maryland along­side. The smoke is from the sunken and burning Arizona, out of view behind the Penn­syl­vania. The California is par­tially visible at the extreme left. The Pennsylvania, which lost five men, remained in service. Right: Hit by six bombs and one torpedo, which killed 60 men, the battle­ship USS Nevada is seen attempting to escape from the har­bor. The crew beached the ship, which returned to service in October 1942. Right: A destroyed U.S. Army Air Forces Boeing B-17C Flying For­tress rests near a hangar at Hickam Field, Decem­ber 7, 1941. 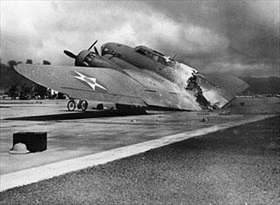 Flown from California to Hickam, it arrived during the attack. On its final approach, the air­craft’s magne­sium flare box was hit by Japa­nese strafing and ignited. The burning plane sepa­rated upon landing. The crew survived the crash.